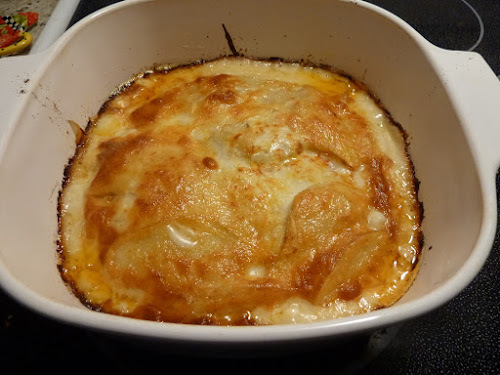 Today I grabbed my mandoline and sliced up four cups of our beautiful potatoes right from the garden and made my first Scalloped Potatoes in about thirty years. A few weeks back, my friend Leslie found a couple of Cornflower Corning pieces at a thrift shop for me. Thank you Leslie. You know I love vintage kitchen things. So I dug it out and this was the result. That cheese crust is adult candy! Looks yummy. It looks yummy! At my age nearly all of my kitchen things are vintage. I still two of the cornflower Corning pieces that I received as wedding presents. The clear pyrex lids and the rest of the others have been broken over the years. They usually bounce, but when thy don't they break into many pieces. It was as good as it looks. Yummm. 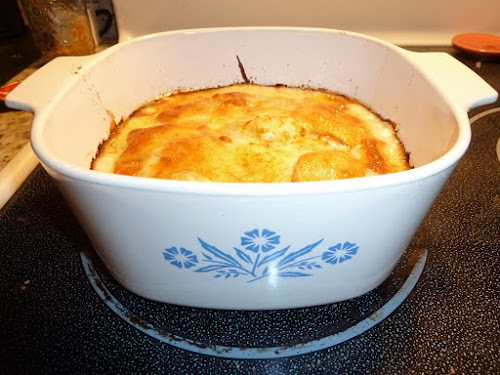 I am really drawn to old Pyrex, Cornflower, pressed glass, TG Green, etc etc. It reminds me of being a kid. I was born in '56. Did you check out my Pyrex cabinet in the post when we did the kitchen?